The Northern Grapes Project (NGP) has released its one year progress report. NGP involves institutions in 12 states and 19 regional wine and grape organizations, many in the Midwest. “It is the first project of its kind to focus on cold climate cultivars” said Project Director, Tim Martinson, from Cornell University’s Department of Horticulture. “We’ve designed this as a five-year project and have just completed the first year of field research,” said Martinson. 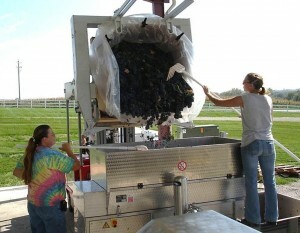 The project’s enologists in Iowa, Minnesota and New York have produced over 200 experimental lots of cold climate wine. During the next year they plan to get the wines bottled and evaluated. The focus of this ambitious 5 year project is helping local wine industries through coordinated research and outreach programs. For example, this year, vine performance was evaluated in 15 locations in 12 states. The cultivars include Frontenac, Frontenac gris, Marquette, La Crescent, and St. Croix. Iowa State University is in the process of analysing organic acids, titratable acidity, sugars and pH for many of these relatively new wine grapes. Iowa State, South Dakota State and the University of Minnesota have also started a detailed study of the ripening dynamics of cold-climate grapes to help harvest timing. This includes examining gene expression, metabolites produced by the grapes and the sensory characteristics of the berry. 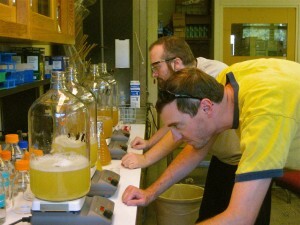 Other ongoing NGP work includes yeast trials underway at Cornell and the University of Minnesota. According NGP officials, the most common question for Northern winemakers is yeast selection. In his enology series for Midwest Wine Press, Nick Smith from the University of Minnesota’s Enology Laboratory, who’s directly involved in NGP yeast studies, agreed. This year, 24 different wines were made for these yeast studies. The wines were made at different locations in the Midwest and Eastern U.S., allowing researchers to tease out the effects of yeast in different growing regions. Deacidification trials testing 52 wine lots with six different deacidification methods are also underway. These tests are overseen by Cornell University’s research enologist, Ann Katharine Mansfield, who moved from the University of Minnesota to Cornell in 2009. Martinson of Cornell is particularly interested in these trials because he says the ability to control acid levels in red non-vinifera grapes will help improve wine quality. “There are years in which the acids don’t come down very much and they [winemakers] really need to do a lot of winemaking gymnastics, either amelioration or chemical deacidification.” He said the NGP studies are disclosing the proportions of different acids in non-vinifera grapes. “There is a lot more malic acid than tartaric acid in ripe cold climate grapes than in vinifera grapes,” explained Martinson. “Malic acid tends to come in at 70%.” He said this has implications for how much you can deacidify without having high pH levels. Winery marketing is another focus. NGP is currently processing 600 customer tasting room collected from seven wineries in Iowa and New York. One of the aims is to determine if there is a correlation between a customer’s satisfaction and their decision to purchase wine. Soon, the NGP also plans to publish the results of an economic survey based on responses from dozens of regional wineries. The survey includes a comparison of cold climate grape production levels to other grapes and statistics showing what sells best in winery tasting rooms. 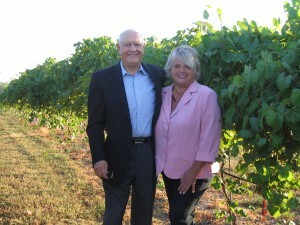 NGP is also helping to tackle another problem facing Midwest winemakers: herbicide drift. Together with the Nebraska Winery and Grape Growers Association and the University of Nebraska Viticulture program, the NGP recently organized a seminar to educate winemakers about herbicide drift. Dr. Paul Read, viticulturist at the University of Nebraska, is evaluating the effects of 2,4-D on the N-1020 varieties. Dr. Read also contacted Iowa State, Cornell and Minnesota for remedial advice about the 2,4-D damage which was the most extensive he has seen. According to its members and regional winemakers, the NGP is helping to overcome a lack of access to expertise and support experienced by some Midwest winemakers. With notable exceptions, like the Missouri Wine Technical Group, many Midwestern wineries have few places to turn when they have a winemaking issue. Tim Rehbein, University of Wisconsin Vernon County Agriculture Agent, said during 2000 he had a lack of sources for questions about efforts to tobacco farmer to grape growers. ‘So I had to seek out answers for my growers and anyone I could find.” Today, Rehbein said he has relationships with enology experts across 16 states from New Mexico to North Dakota and in Canada. Building a professional network can be difficult for winemakers without established connections. Locating credible advice is often time-consuming and inefficient. Zumpfe says he appreciates what the Project is doing to bring the cold climate grape industry together “as a unified force.” He said that while state associations and universities are addressing issues relevant to growers and wineries, distances and state borders can cause duplication of efforts. Since regional variations in climate and soil conditions over the 12-state area covered by the project are so diverse, site-specific topics are addressed by regional conferences and direct lines of communications between the universities and the vintners. ‘I can contact Anna Katharine Mansfield at Cornell or Nick Smith and Katie Cook at Minnesota,” said Funk. With NGP, Anthony is also testing grape varieties for their blending potential. “Among these are Skujins and Michurenitz of Russian origin, Landot Noir, Traminette, Aurora and Diamond,” she said. However beyond next year, the NGP’s future is not certain. The 5 year project only has funding for its first two years with a $2.5 million grant from the USDA’s Specialty Crops Research Initiative Program and matching funding from participating industry and stakeholder groups. Like some other issues of national importance, its future depends on Congress. “The whole program funding is uncertain and contingent on the Farm Bill being passed by Congress.” In 2013, the NGP will submit an application to its USDA funding extended. One important recent discovery, not related to the NGP, could also greatly impact Midwestern grape production. During April 2012, Cornell announced the identification of the gene that causes ripening in tomatoes. Controlling this gene will someday make it possible to control the ripening speeds of many fruits and vegetables ‘For understanding tomato ripening and eventually taste, this could be the Holy Grail,” says Jim Giovannoni, a project scientist at Cornell’s Boyce Thompson Institute for Plant Research.